Instagram is a wonderful social network for sharing pictures and moments, and now that Instagram supports multiple account switching you can easily change between personal, public, private, and work related Instagram accounts. If you have decided you no longer want to use Instagram, or no longer need a particular Instagram account, or perhaps you have found Instagram to be too distracting, you can do something about it. 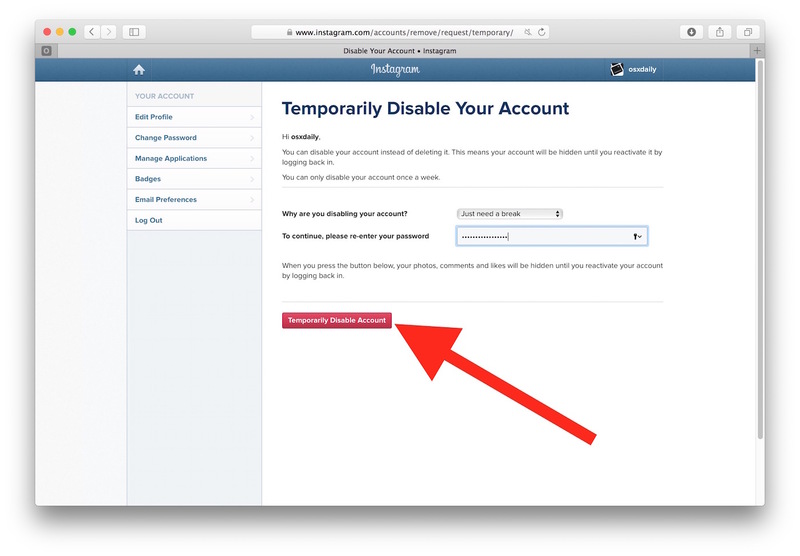 You can choose to either disable an Instagram account temporarily (which can be reversed and reactivated), or if you want to go all out, you can permanently delete a Instagram account as well, thereby removing it and all associated posts and pictures from the service. You can temporarily disable an Instagram account, meaning the Instagram profile is no longer visible to anyone, and it appears as deleted to the outside world, but this can be reversed and the account with all of its pictures and posts can be re-activated again at any time. This is helpful if an account needs a hiatus or may need to be used again in the future, and temporarily disabling an account is what most users would likely want to do. You can also completely delete an Instagram account, this not only removes the account and all of the associated pictures and posts, but the username can not be reactivated, and the account can not be reactivated either. This is permanent and can not be undone, the Instagram account and all of the posts will be gone forever, so you should not take this lightly. 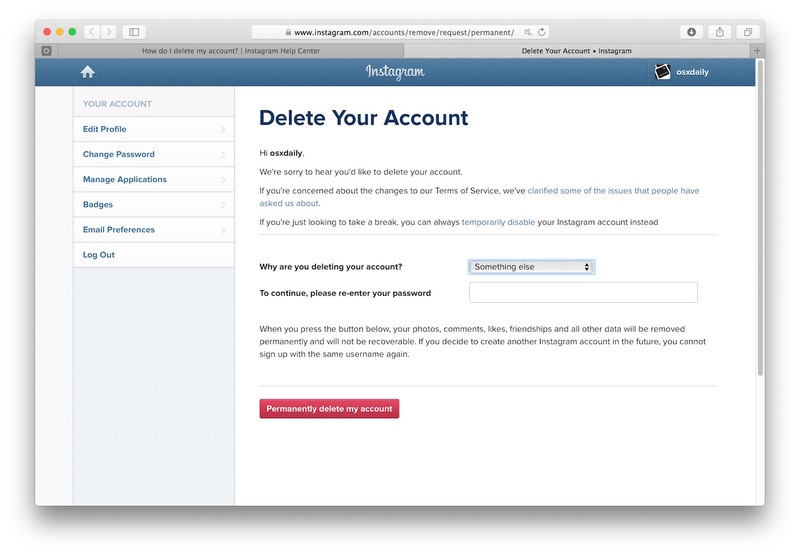 If you are going to permanently delete an Instagram account it is highly recommended to download the Instagram pictures to a computer beforehand, otherwise they will be removed forever, unable to be recovered. This is permanent and there is no way to undo the deletion of an Instagram account, all pictures, posts, profile data, everything at all is removed including the account username (meaning someone else could claim the username). This is not recommended unless you are absolutely certain you want to delete an account and all of it’s associations on a permanent basis. Instagram and Twitter are the only social networks I use. Everything else is rubbish. Instagram and Twitter and being flushed to the toilet by product designed though, keep it simple for best results. Useful information, Sharing with friend who want to delete his Instagram account. I deleted my account in past, but wisely I did a backup before with 4K Stogram, it downloads INsta photos on computer, I have my memories on my hard drive now! I am not able to temporarily disable my insta account even after following the steps. When i click on disabling button, it leads to homepage. What kind of a bug is this?? Help!! I am having same issue as users above–I can’t temporarily disable. I follow all the steps, but when I clock on yes I’m sure, I am redirected to my newsfeed. Having the same issues as everyone else, it’s not allowing me to disable its sending me back to my newsfeed. If i delete my account permenantly will it also delete the conversation i did with somone?? I’m having a bit of trouble with this. I want to permanently delete my account so I can create a new one, and that’s what I’ve done. The trouble is, when I enter Instagram, the account is still there and I’m at the maximum number of accounts! Please, help! You will have to create the new Instagram account using a new email address. And make sure the other Instagram account is deleted, rather than disabled.